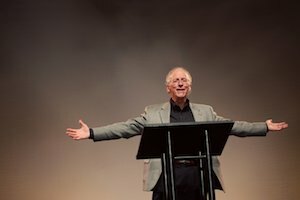 The final session of this year National Conference went to John Piper who was asked to reflect on the twenty-fifth anniversary of his groundbreaking book Desiring God. Much of what he did this morning was summarize what he has been teaching all these years, because in all these years, he has not changed the focus of his ministry. But he sought to address some of the misunderstandings and to fill in some of the gaps that have been raised in the years since he wrote the book. He said that the book came out of the tension of having to choose between him being happy and God being glorified in his life. The origin of Desiring God is a desire to be happy. Our hearts are desire factories because God made them that way. You can’t choose to not want to be happy, so there has to be a solution to your quest to be happy being right and God’s desire to be glorified being right. He waded right into this tension twenty-five years ago and has remained there throughout his ministry. Particularly interesting was the way in which Piper drew lines between Desiring God and some of his other books. He did this as a means of answering a question he has often been asked: How can you believe that God makes much of us? We understand what we are to make much of God, but are we really to believe that God seeks to make much of us? This was the main issue at the heart of his book God Is the Gospel. And so Dr. Piper spent the bulk of his message defending his view that God does make much of us, at least in a certain way. Because this blog is meant to be just a short summary, and because the message will soon be available online, I will leave it to you to hear his stirring defense and to encourage you that you are precious to God, that it is his joy and to his glory to make much of you. I can lose everything on the planet and gain one thing—Christ—and call it gain.